How I Make Senior Sessions Fun from Kim Craven! Being an adult and trying to connect with high school seniors can be taunting task. We asked high school senior photographer, Kim Craven how does she make every senior session fun! *First, I check out my senior social media pages, and I also make sure I either meet them or talk to them on the phone before the session. By doing that, I get a little insight into their personality. *Third, when selecting a location, I use the information that I received from my senior. If they have a vision, I would decide on a location from that (95%of the time they have no idea.). *Fourth, I always come to the session with a smile, laughter, and some corny jokes! Sometimes, the night,before I research some social media culture that I think my senior would be interested in. Or I’ll ask my daughter what’s going on in the world of music and reality tv just to build a rapport with them. *Fifth, during the sessions, I ask my seniors some silly questions about themselves and especially if their parents are with them. i.e.,”Does your mom get on your nerves sometimes?” For some reason that always seems to open them up, and they talk freely about everything! *Sixth, I make sure my senior brings their own props. I ask if they have something special that they would like to have in the images. It could be a favorite book, headphones, or a favorite piece of clothing. 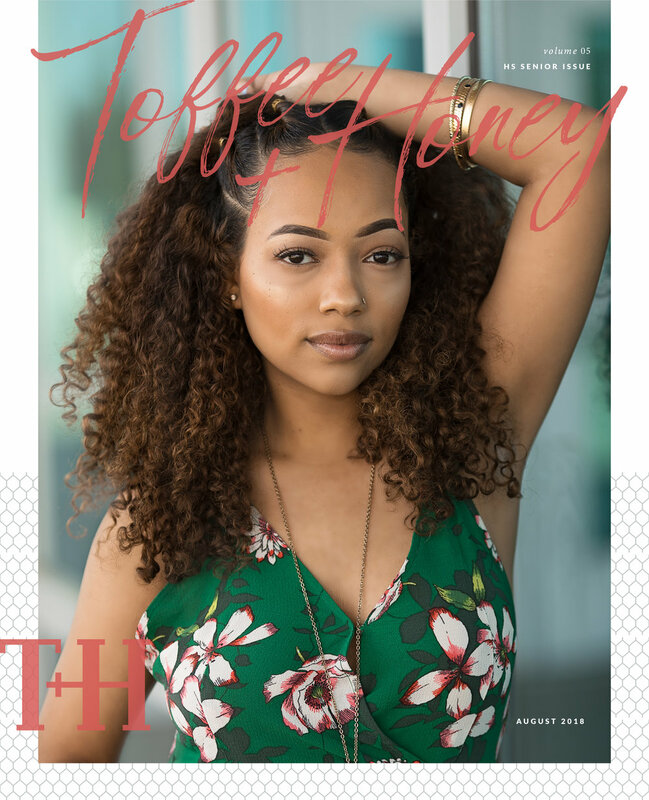 Check out the High School Senior Issue of Toffee and Honey!